Motorcycle Deaths Down … Or Up? Part 1: How dangerous is motorcycling, anyway? You’re probably not too keen on discussing the dangers of motorcycling, But occasionally someone blathers on about motorcycle fatalities, and that tends to get us thinking. The Governors Highway Safety Association made a big splash two years ago, when the preliminary data for 2009 showed a decrease in U.S. motorcyclist fatalities for the first time in more than ten years. There was some optimism that finally something was working to reduce motorcyclist fatalities, which had soared to an all-time high of 5,290 in 2008. The Motorcycle Safety Foundation and many state programs were quick to take credit, but the self-congratulations were short-lived. On May 22 of 2012, the GHSA issued another press release quietly noting that fatalities had leveled out again. If you want to read the latest News Release from the GHSA, follow this link. 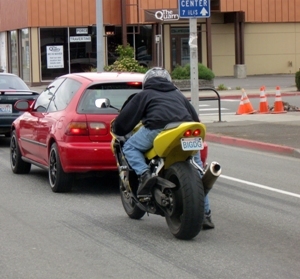 What the GHSA (and a number of other agencies) have been trying to measure is the relative danger of motorcycling, and whether the risks are going down or up. This is an uncomfortable subject, but if we really want to manage our risks of riding, it’s not helpful to ignore what’s happening. So, just between us motorcyclists, let’s share a little information about fatalities. The press releases from the GHSA are less than useful, because they talk only about total fatalities and not about the rate. What do we mean by "fatality rate"? Let’s say there was a total of 100,000 motorcyclists in Washington, and 52 died in one year. That would be a rate of 52 per 100,000. OK, what if there were, say, 7 million motorcyclists in the USA and 5,000 of them died? That would be a fatality rate of around 71 per 100,000. One big problem with calculating a motorcycle fatality rate is figuring out how many motorcyclists there are on the road. 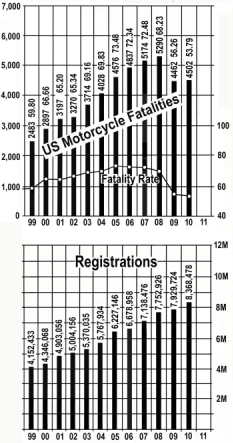 For years I’ve tracked the USA fatality rate based on motorcycle registrations and fatality data from the feds. I realize that’s not very scientific, since the number of motorcycles registered is only an approximation of the number of riders. For instance, let’s say Tom owns five bikes, while Dave only owns one. If Tom crashes, his rate is only one crash per five registered bikes. If Dave crashes, his rate is one crash per registered bike. And of course, registrations don’t show Tom’s or Dave’s exposure, say in terms of miles traveled, or numbers of trips. Tom might have one or other of his machines on the road for thousands of miles each year, while Dave might only fire up his scoot three or four times each summer. So, there can be a huge difference in exposure. On the positive side, both fatality and vehicle registration numbers are counted carefully, so I’ve been willing to accept the "fatalities per 100,000 registered motorcycles" as a reasonable clue about what’s happening. There was a sales boom in the 1970s that put an additional million bikes on the road. 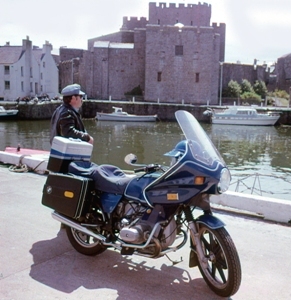 I flew my BMW R80 to England in 1980, and went to the TT on the Isle of Man. I remember feeling that riding the Island during TT week among 40,000 semi-crazed race fans was pretty dangerous. But the truth was that motorcycling back in the USA was at the peak of danger. The surge of new USA riders resulted in a huge increase in fatalities. The worst year of that surge was 1980, with 5,144 fatalities. The feds ordered a study—which we know today as the "Hurt Report." That got us started on the path of rider training and licensing. Then, after the 1980 boom, motorcycle registrations fell off. The fatality total bounced up and down a bit, but eventually dropped to a low of around 2,000 in ’96-’97. Everyone was pleased at that, because it seemed to prove that motorcycling was gradually getting safer, just as automobiles and trucks had been getting safer. Rider training and licensing appeared to be solving the motorcycle fatality problem. But around 1998, the bubble burst. Motorcycle sales surged again, and there was another dramatic increase in fatalities. By 2008 there were 7.7 million motorcycles registered nationwide, and 5,290 fatalities. What happened to the dream that motorcycles could be made safer? Part of the answer can be found by looking at the fatality rate. The rate was highest in 1978, at 94.02 fatalities per 100,000 registrations. At the ebb in 1997 the rate was 55.30. But following the new surge in bike registrations, the fatality rate climbed back up, hitting a high of 73.48 in 2005. The fatality rate dipped slightly in 2009, to 68.23, and then down to 53.79 in 2010. The good news—the news I would have thought the GHSA would have jumped on—is that the motorcycle fatality rate had dropped. Registrations are up, but the fatality rate is down. There’s a basic flaw in using registrations to calculate motorcycle fatality rates. Motorcycles just get ridden much less than passenger vehicles. Yes, there are a few riders who put down lots of miles every year, but very few motorcyclists use their bikes for daily transportation. And bikes that are registered but parked most of the time really skew the rate. The number of trips, or the miles traveled are potentially better for calculating a fatality rate. We’ll get to that in Part 2. Do sales surges lead to fatality surges? Meanwhile, we might draw some conclusions from the fatality rate. It makes sense that whenever there is a big surge in registrations, there will be an increase in the fatality rate. We might theorize that when bike sales are booming, there are more newbies entering the sport, and they don’t have the experience or skill to avoid crashes. When the buying/fatality surge tapers off, it’s likely because fewer noobs are getting into the sport, so the remaining active riders are (by comparison) smarter and more skilled. For example, when money got tight in 2008, bike loans were harder to obtain. New bike sales were down, but used bike sales and repair were up. By 2009 there were more bikes on the road, but fatalities dropped. We might theorize that the noobs who got into motorcycling in the previous decade (and managed to survive) were finally getting clever enough to avoid fatal crashes. David L. Hough is a veteran road rider and moto-journalist, living near Port Angeles at the far northwest corner of Washington State. He has traveled extensively on several continents on both two-wheeled and three-wheeled motorcycles. 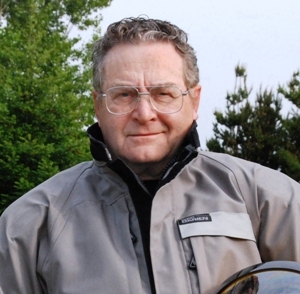 Dave has contributed skills columns to various motorcycle magazines for many years, including Motorcycle Consumer News, Friction Zone, BMWMOA Owners News, and Sound RIDER!. He has received considerable recognition for his work, including two awards from the Motorcycle Safety Foundation, and induction into the AMA Motorcycling Hall of Fame. He is the author of several motorcycling books, including Proficient Motorcycling, Street Strategies, and Driving A Sidecar Outfit. Hough is a retired MSF motorcycle safety instructor and past Chief Instructor of the Sidecar Safety Program.